At The Sign Shop™ we take great pride in our craft of developing compelling visual images in the form of signage, vehicle graphics, billboards, logos and more. 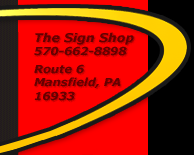 Established in 1990, The Sign Shop™ is known in Twin Tiers of New York and Pennsylvania as being on the cutting edge of sign innovation and design. Our goal is to create signs that captivate people and draw them to your business or organization. We offer many sign and graphics products, as well as custom logo design, sign servicing, installation and maintenance. We are conveniently located between Mansfield and Wellsboro Pennsylvania on Route 6. Please feel free to stop by or give us a call at 570-662-8898.